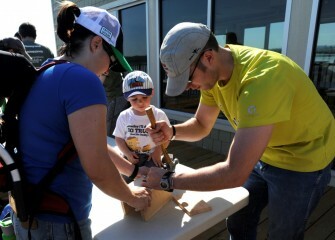 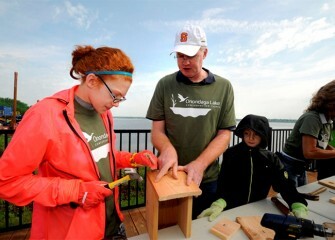 Home » Gallery "Western Shoreline"
June 2016 - Tracey (left) and daughter Corrin Stellakis, from Bridgeport, NY, assemble a bird box they will later install along the western shoreline of Onondaga Lake. 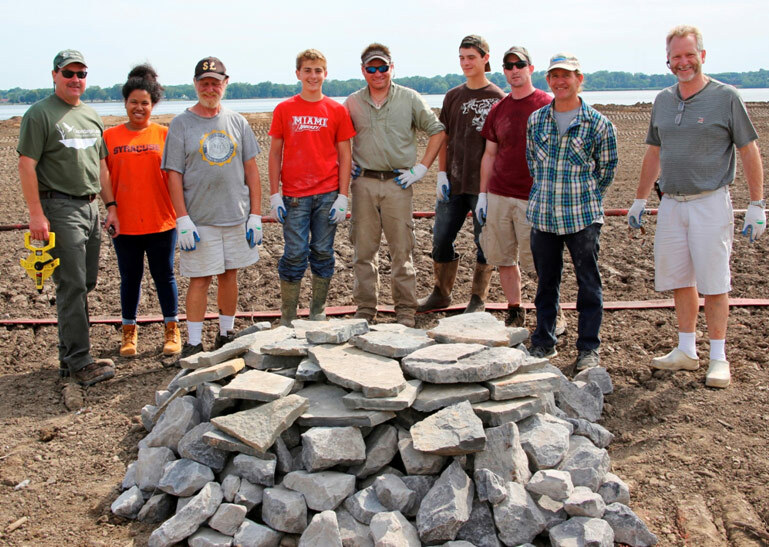 June 2016 - Nearly 40 volunteers participated in an Onondaga Lake Conservation Corps event on June 18 to build, install and survey habitat structures and birds and wildlife along the Western Shoreline. 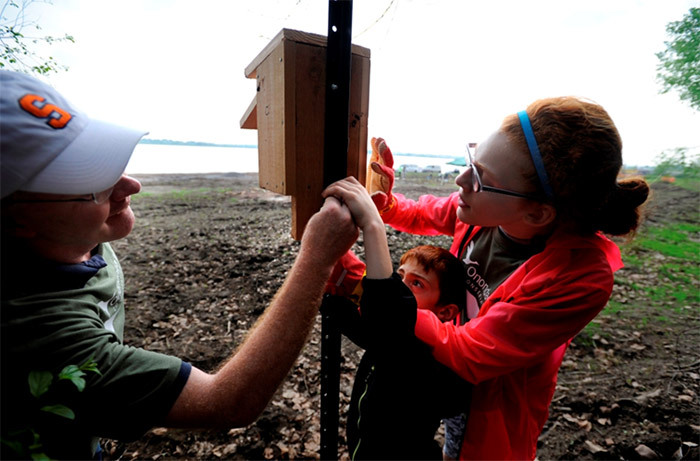 June 2016 - Two-year-old JJ observes as Stacey Keefe and Ben Larsen, of North Syracuse, construct a nest box suitable for Eastern Bluebirds. 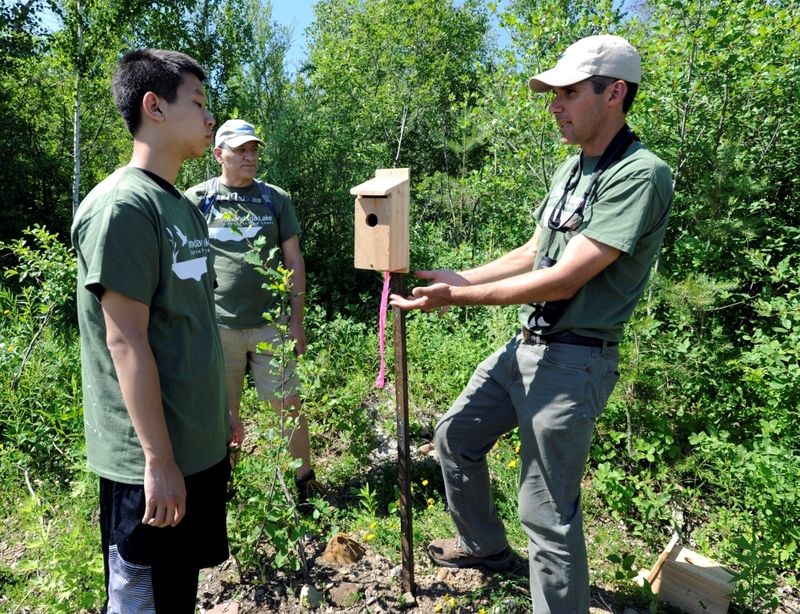 June 2016 - Nest boxes are built in dimensions that support particular species. 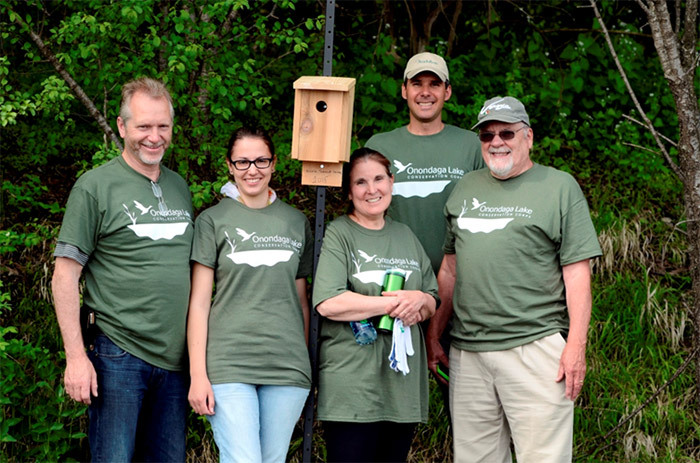 Placing Eastern Bluebird boxes in fields and grassland areas has helped recovery of this species in recent years. 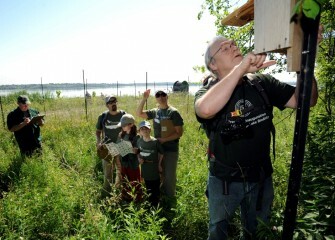 June 2016 - Onondaga Lake Conservation Corps volunteer Douglas Beauchamp inspects a nest box installed last year, while the Keefe family observes birds in the area and Steve Mooney helps records data. 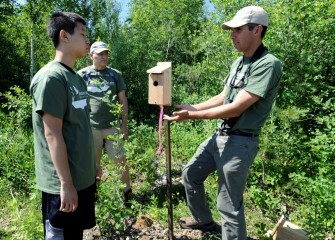 June 2016 - Montezuma Audubon Center Director Chris Lajewski (right) explains to Josh Zhao (left) and Richard Blankenship that the height and placement of a nest box is as important as the dimensions of the box itself to attract target species. 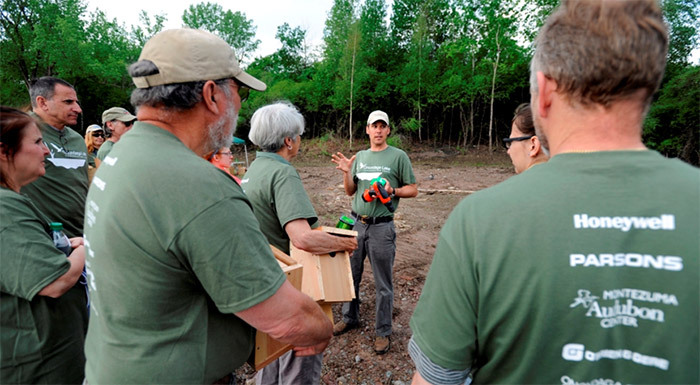 June 2016 - Professor Peter Ducey, Ph.D., of SUNY Cortland, leads Corps volunteers on a walk seeking signs and sightings of amphibians and reptiles. 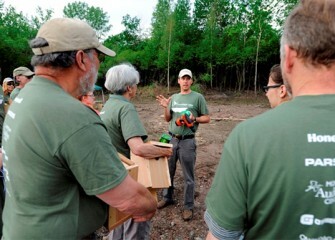 Professor Ducey is an expert in the field of herpetology, a subfield of zoology. 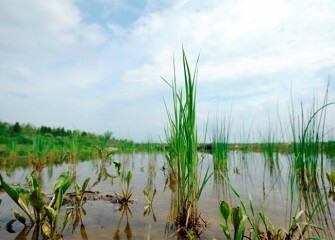 June 2016 - The population sizes and health of amphibian and reptile communities, as well as bird species, are indicators of the status of recovering ecosystems. 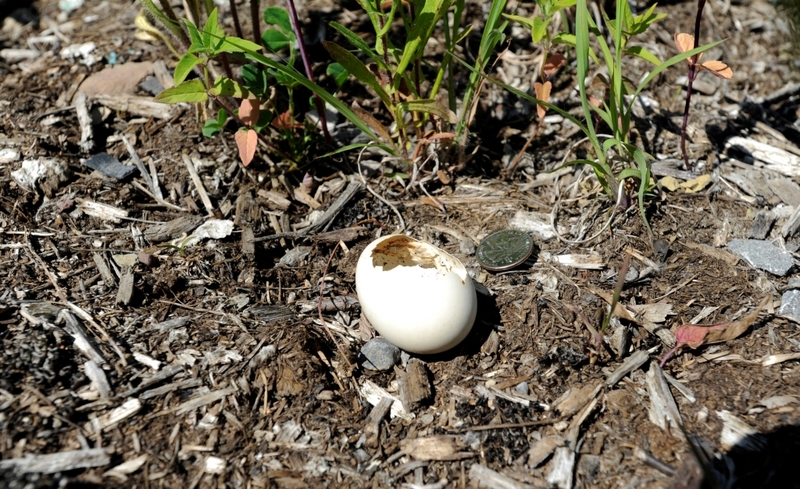 June 2016 - This shell indicates that waterfowl are breeding along the shoreline. 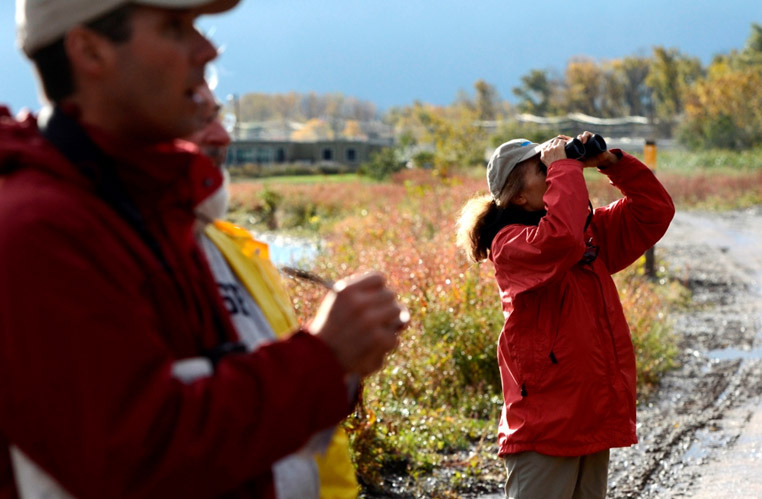 Onondaga Lake has been designated an Important Bird Area by Audubon because it provides important habitat for migratory species. 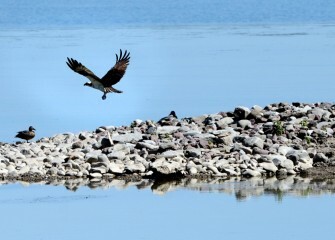 June 2016 - An Osprey is seen along the shoreline hunting fish at the lake. 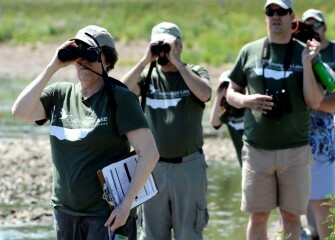 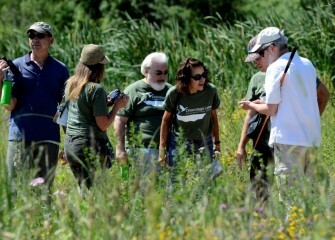 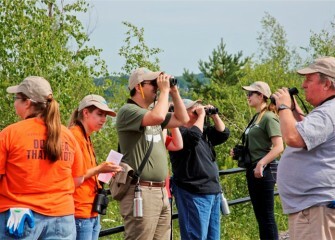 June 2016 - Onondaga Audubon Society (OAS) members help other Corps volunteers identify and record 37 bird species over a few hours Saturday morning. From left are Angela Thor, Paul Richardson (President of OAS), and Frank Moses. 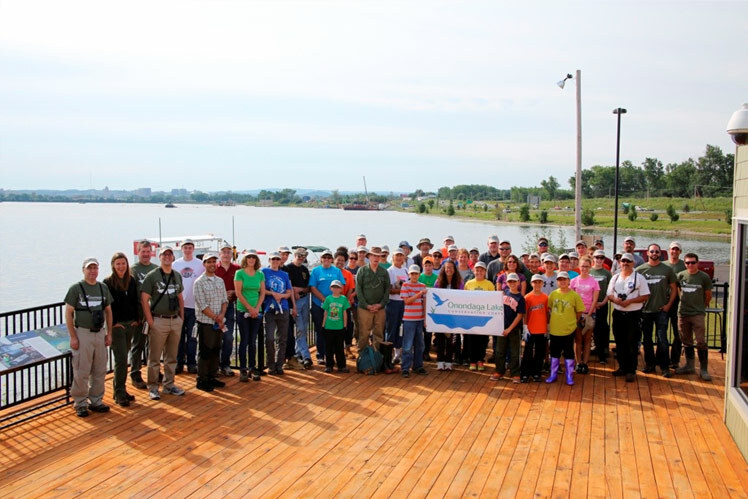 June 2016 - Observations are recorded and will be added to databases monitoring the health of Onondaga Lake as the lake cleanup progresses. 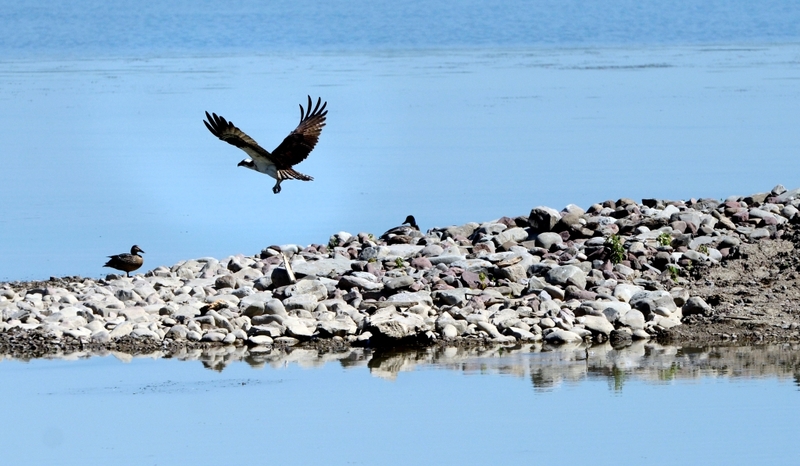 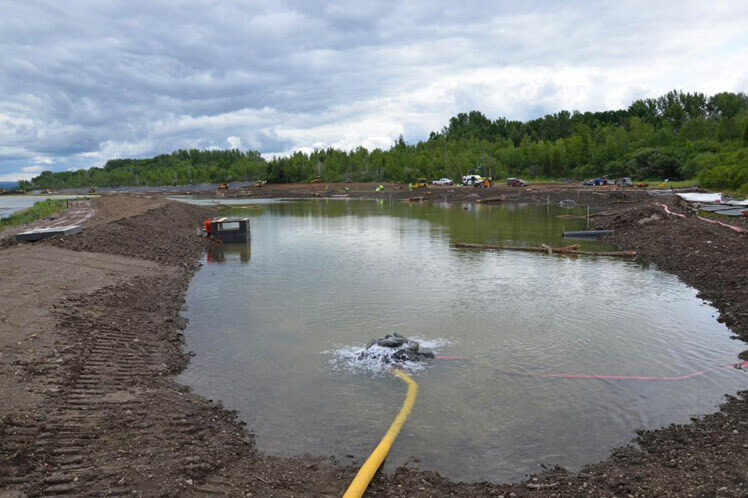 More than 170 species of fish, birds, and other wildlife have already returned to restored habitat near the lake. 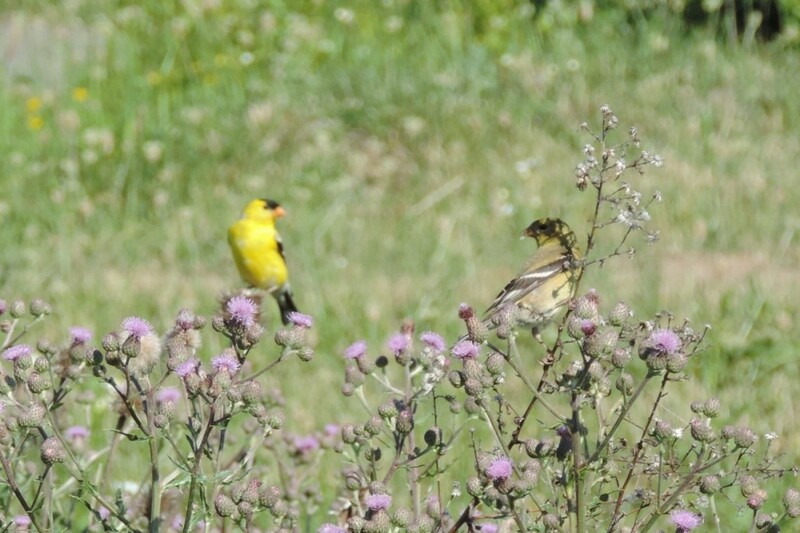 June 2016 - A breeding pair of American Goldfinches was spotted by volunteers birding near the Onondaga Lake Visitors Center. 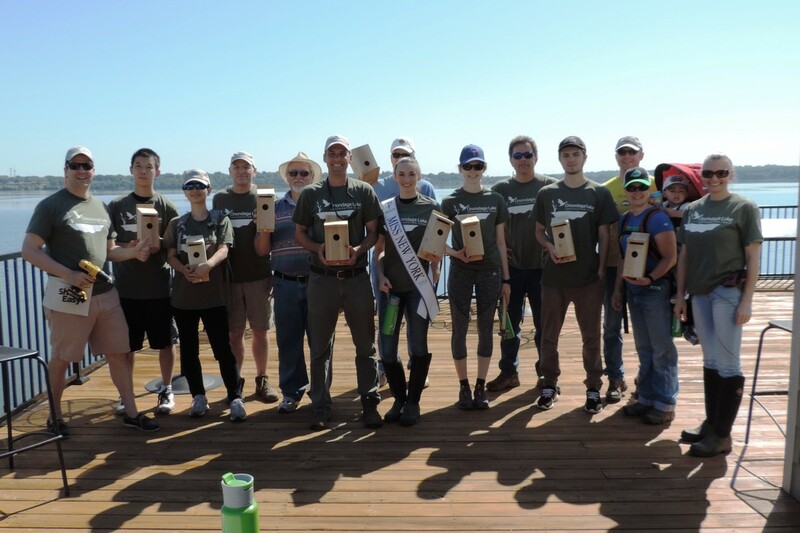 June 2016 - Nest boxes are finished and ready for installation in restored habitat along the Western Shoreline. 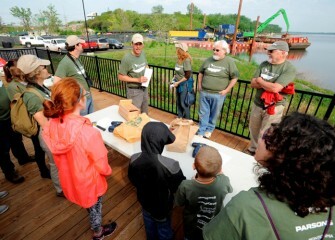 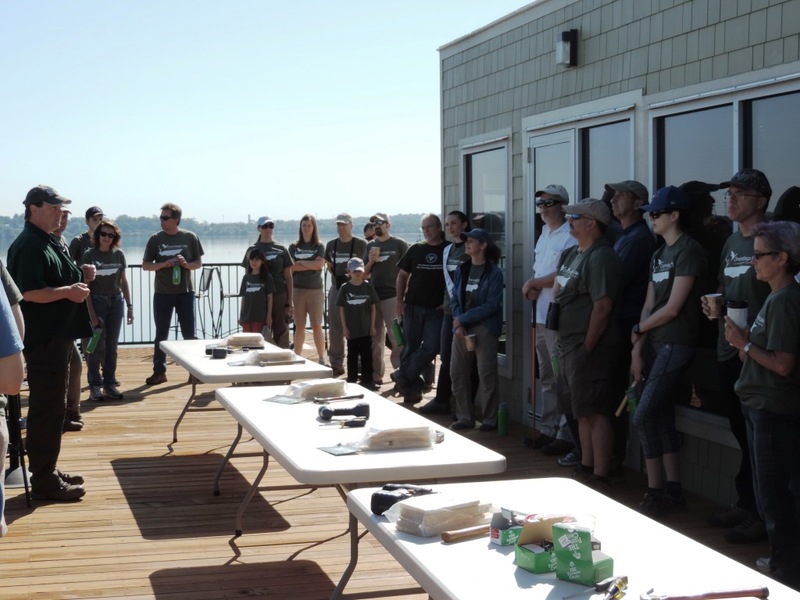 June 2016 - Steve Mooney (left), Project Scientist with OBG, briefs volunteers Saturday morning before activities begin to build and install habitat structures and engage in citizen science monitoring. 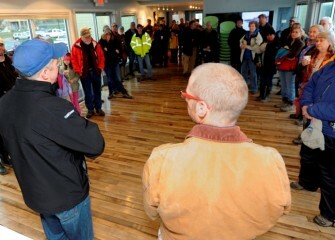 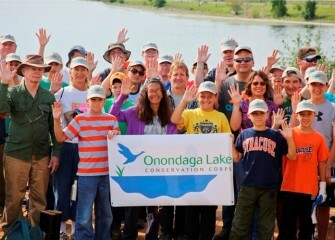 October 2015 - After arriving at the Onondaga Lake Visitors Center, participants are welcomed by Christopher Calkins (left), Vice President at O’Brien & Gere and fellow Onondaga Lake Conservation Corps volunteer. 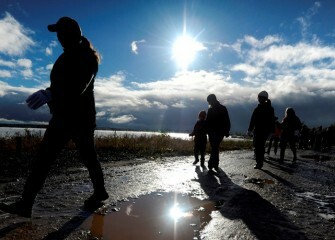 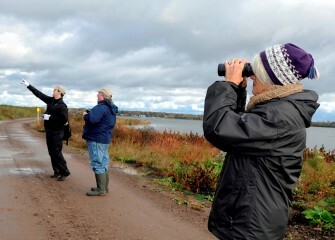 October 2015 - Rain and wet snow earlier in the morning clear just as volunteers head out along the western shoreline to plant trees and observe birds. 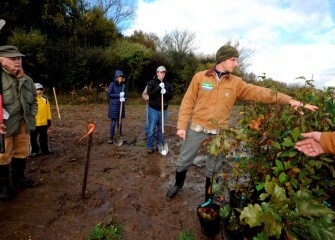 October 2015 - Tony Eallonardo, Ph.D., scientist in plant ecology and ecosystem restoration at O’Brien & Gere, shows volunteers the variety of trees they will plant. October 2015 - Meanwhile other Corps members work to identify birds along the shoreline. 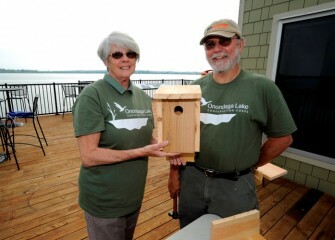 Left is Frank Moses, Onondaga Audubon’s Onondaga Lake liaison, with Paul Marconi, Syracuse, and Cheryl Belle from Baldwinsville. 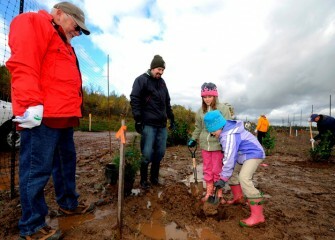 October 2015 - Autumn (right) and twin sister Evelyn Keefe work hard at digging the hole just the right size and depth for a new tree, as their father Nathan and grandfather Larry watch. October 2015 - Evelyn places an eastern white pine carefully in its new spot along the Onondaga Lake shoreline. 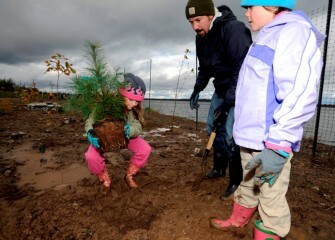 Eastern white pine (Pinus strobus) grow to 150 feet tall and live 200 years or longer in an undisturbed location. 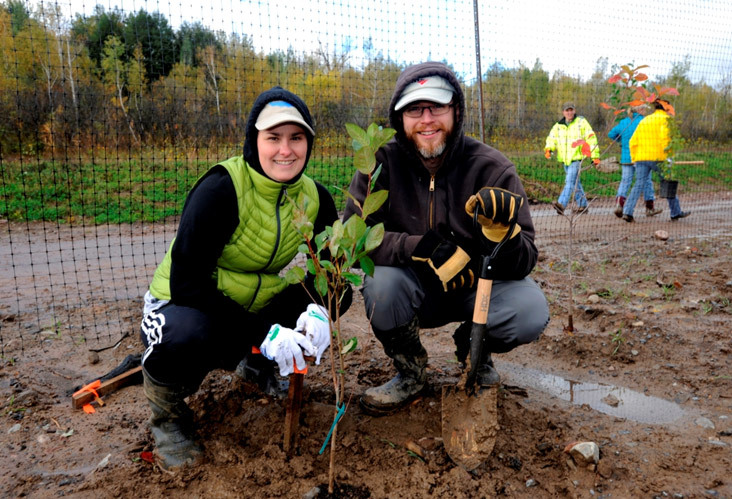 October 2015 - Grace Getman, of Syracuse, works together with Steve Mooney, Managing Scientist at O’Brien & Gere and Corps volunteer, to properly pack soil around a young spicebush (Lindera benzoin) they just planted. 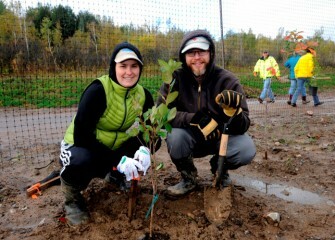 October 2015 - Stacey Keefe and Ben Larsen, of North Syracuse, plant a black chokeberry (Aronia melanocarpa), native to the Great Lakes region. 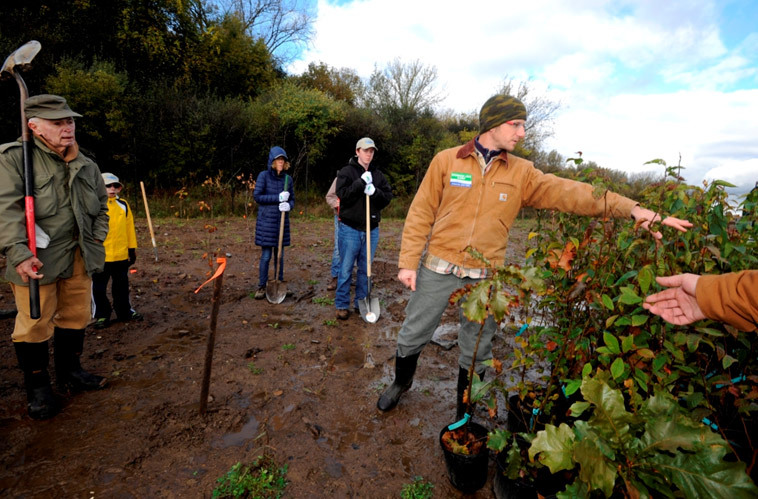 The black chokeberry will eventually produce abundant rich berries that serve as food for wildlife and birds such as Ruffed Grouse. 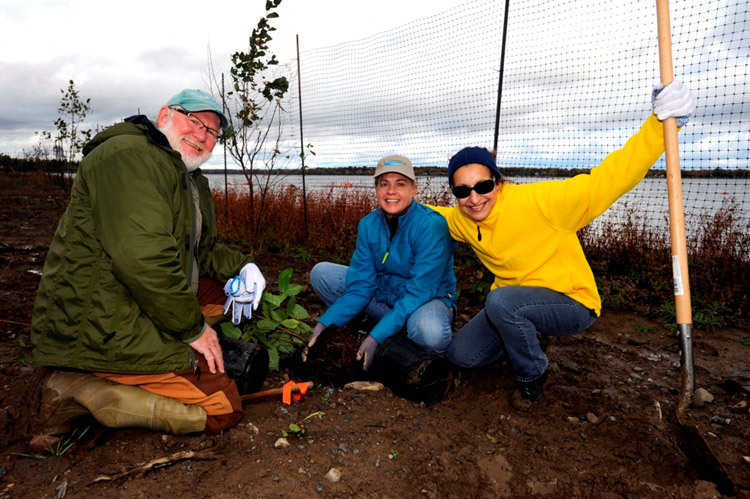 October 2015 - Joe McMullen, of Liverpool, Pam Wildridge, from Jamesville, and Sue Potrikus (right), North Syracuse, enjoy taking part in restoring habitat along Onondaga Lake’s shoreline. 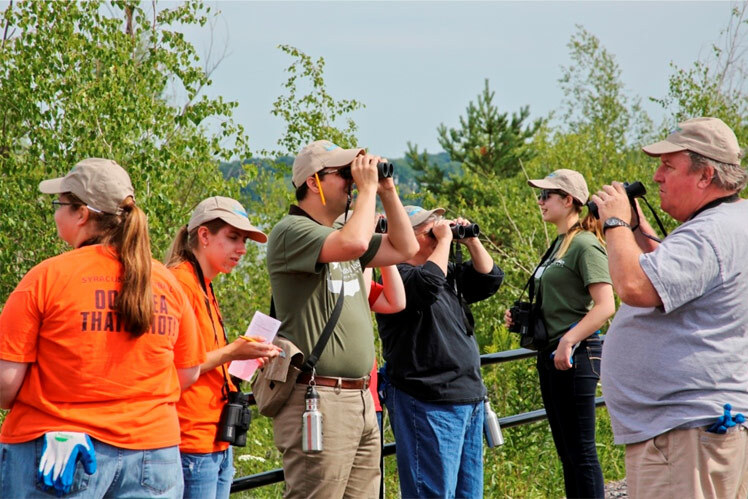 October 2015 - Bird species and numbers are noted by Audubon and Corps volunteers. 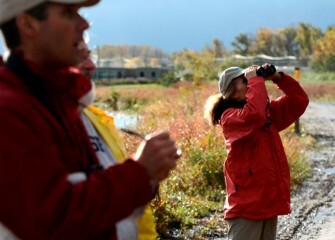 Chris Lajewski (left), Director of Montezuma Audubon Center, records birds Ruth Florey, Onondaga Audubon and Corps volunteer, spots in nearby trees. 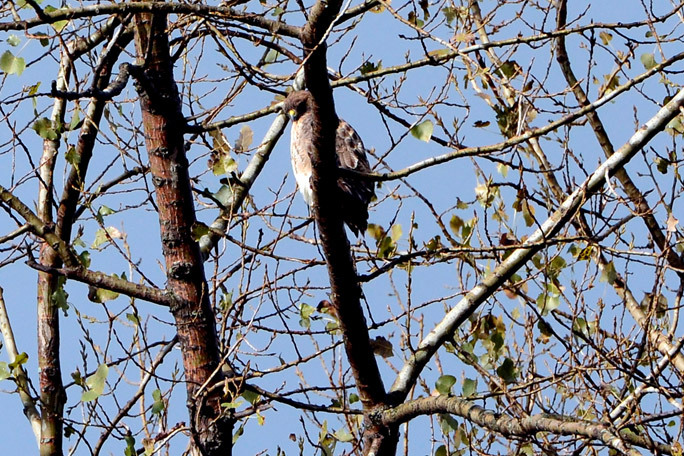 October 2015 - A Red-tailed Hawk is seen in a tree along the shoreline. 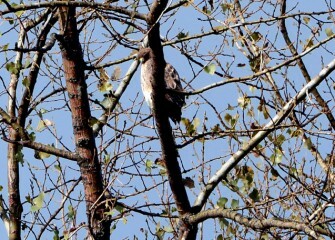 Red-tailed Hawks prefer to perch in high spots near open areas, scanning the ground for prey. 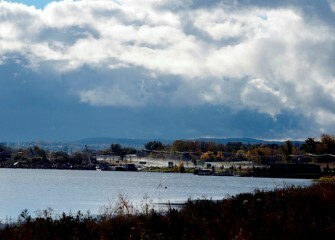 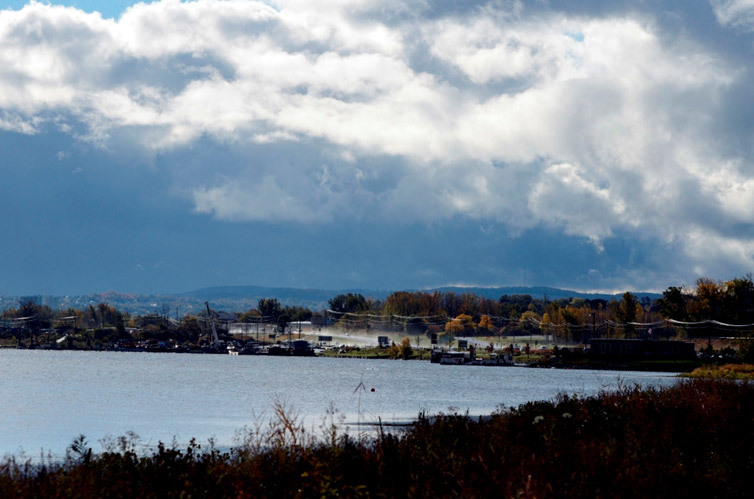 October 2015 - Further south along the Onondaga Lake shoreline, near I-690, is the support area for capping activities on Onondaga Lake, which continue through fall 2015 and will resume next spring. 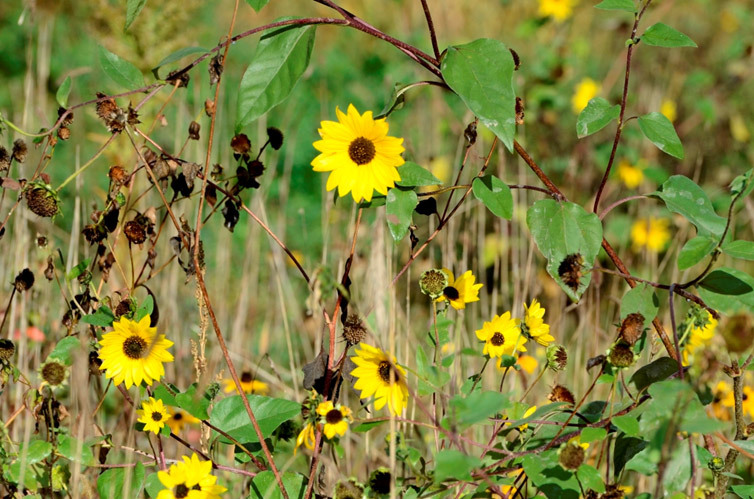 October 2015 - Common sunflowers (Helianthus annuus) planted in an earlier restored habitat area bloom into fall. 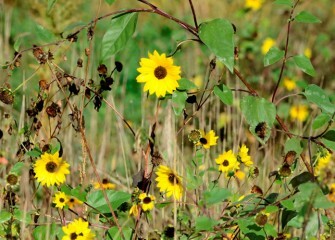 Common sunflower, a native plant, provides excellent cover for wildlife and seeds for many species of birds. 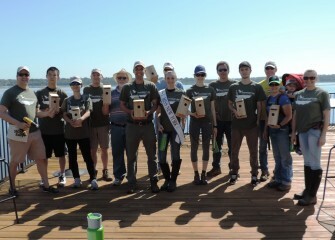 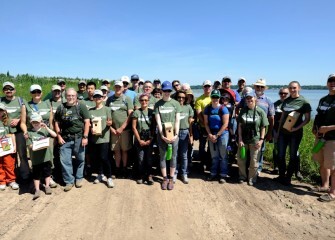 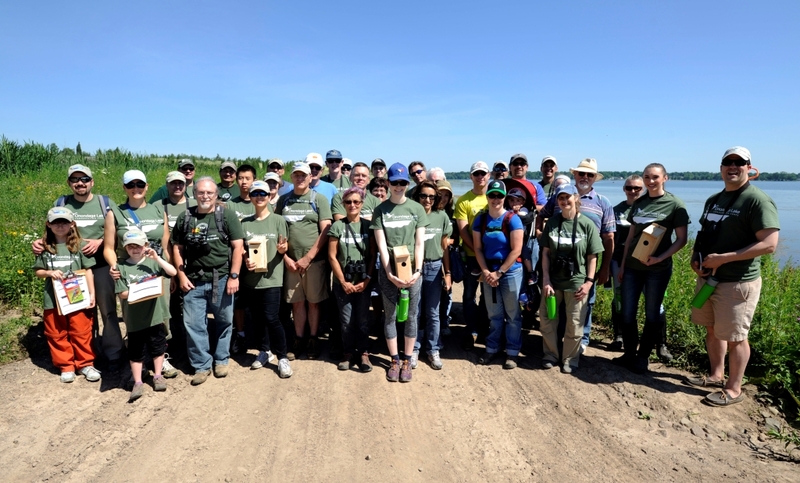 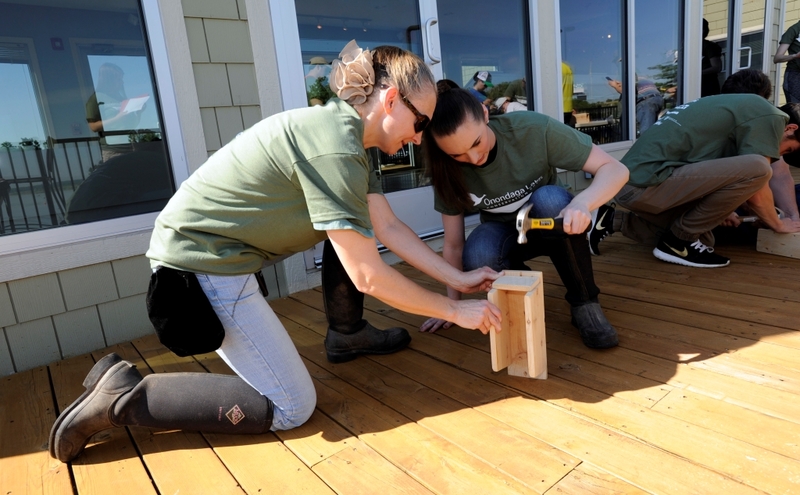 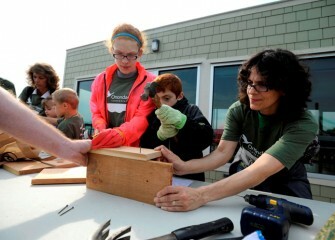 May 2015 - Fifty-one volunteers attended an event to build and install bird boxes and plant native vegetation along the western shoreline of Onondaga Lake. 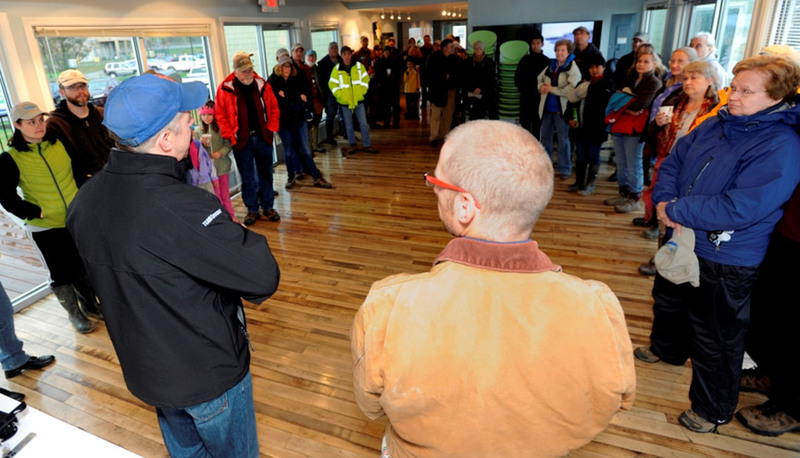 May 2015 - The Onondaga Lake Visitors Center was built on the western shoreline by Honeywell to provide the public with access to the work taking place at Onondaga Lake. 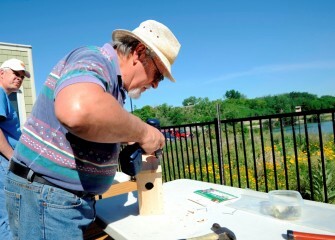 May 2015 - Nathan Bustin, of Clay, hammers a nail into a nest box suitable for Eastern Bluebirds or Tree Swallows while his family stabilizes the boards. 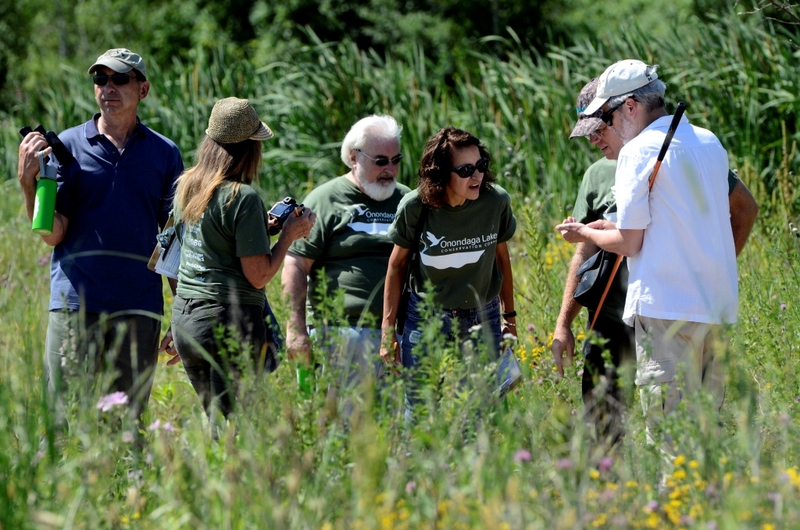 May 2015 - Building in the right dimensions is critical to attracting desired species. 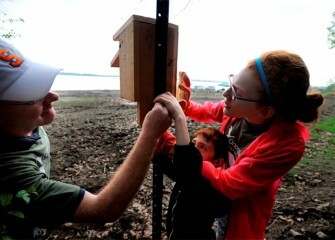 Mark Bremer, of Manlius, constructs a bird box with his daughters Sammie (left) and Ali. 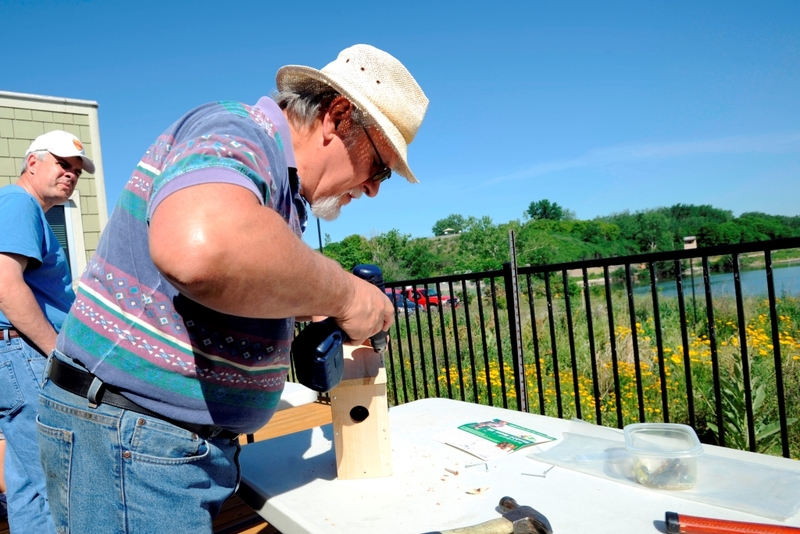 May 2015 - Tree Swallows and Eastern Bluebirds nest in cavities and often face a shortage of suitable nesting spots. 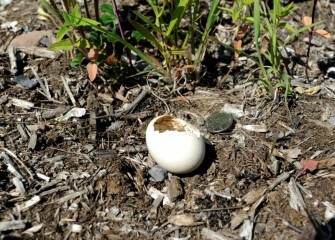 Providing breeding boxes assists their reproduction, and in turn survival of the species. 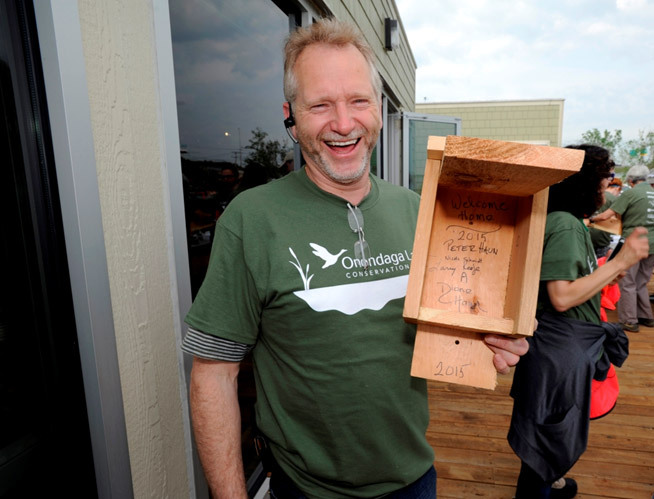 May 2015 - Peter Haun, from Fairmount, displays a box he helped build with a “Welcome Home” message for birds. 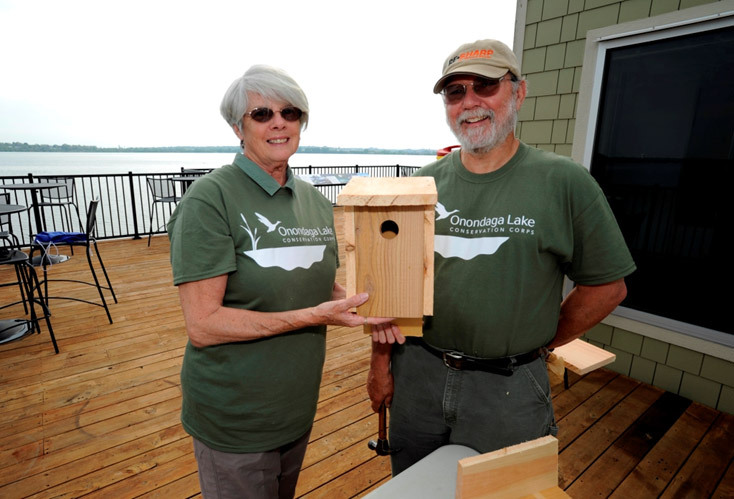 May 2015 - Onondaga Lake Conservation Corps volunteers Cheryl and Robert Belle, from Plainville, with the Tree Swallow box they assembled. 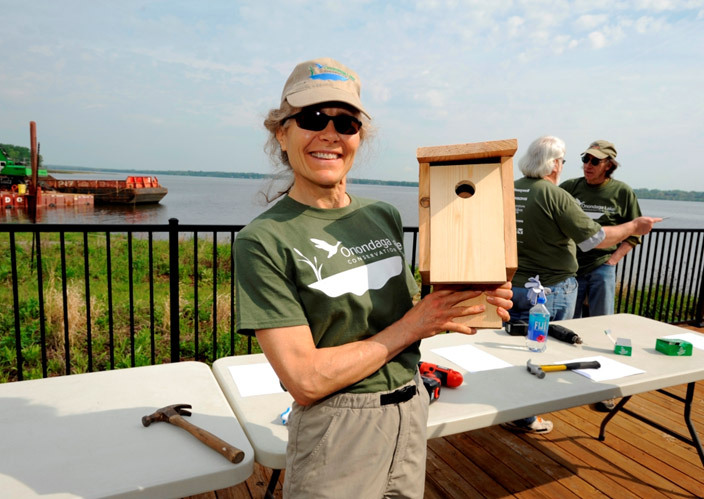 Tree Swallows prefer to nest in a open area such as near wetlands or a lake. May 2015 - Onondaga Audubon member and Corps volunteer Ruth Florey with a breeding box to be installed along the shoreline. 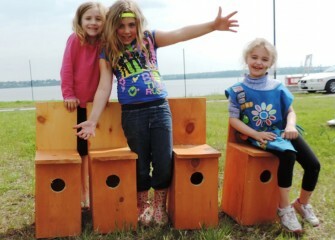 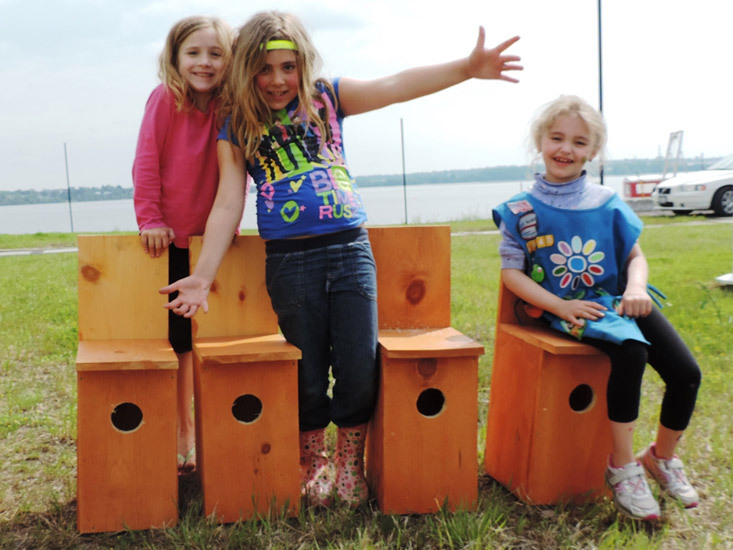 May 2015 - Members of Girl Scout Daisy Troop 41140 from North Rose built larger nest boxes for American kestrels, North America’s smallest falcon. 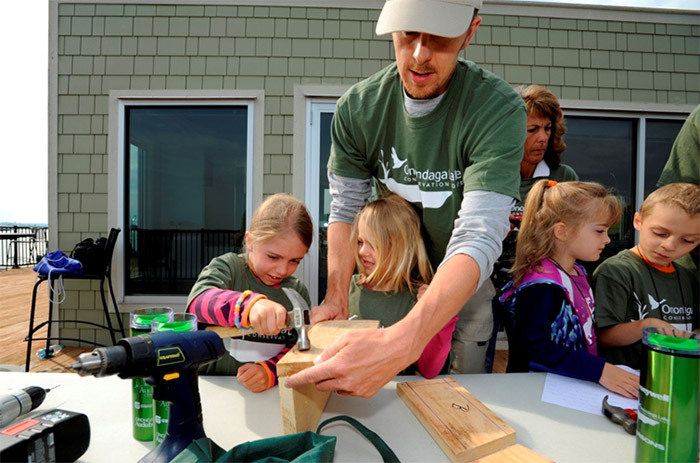 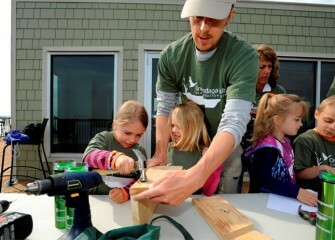 May 2015 - Center Director Chris Lajewski of the Montezuma Audubon Center explains important features of successful nest box installation, such as height off the ground and spacing. May 2015 - Abby Bustin (right) works on fastening a nest box to a pole with her brother Nathan and father Cary. 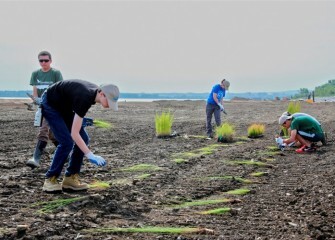 May 2015 - Volunteers also planted native species along the western shoreline, including soft rush, swamp milkweed, New England aster, fox sedge, and prairie cordgrass (seen here). 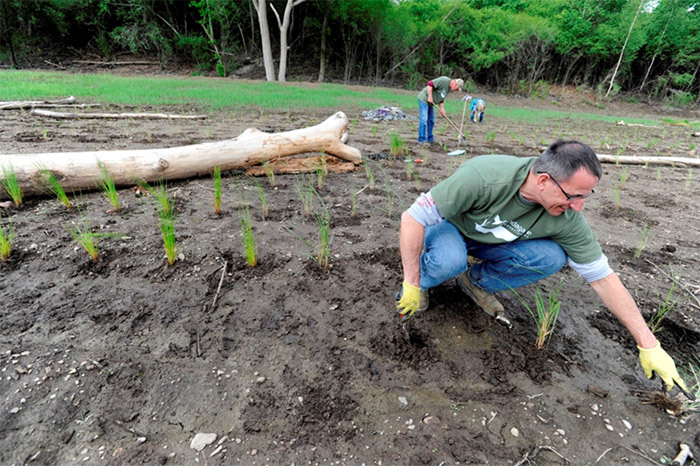 May 2015 - Daniel Sabene, from Camillus, plants prairie cordgrass. 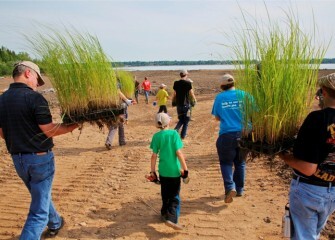 Left and behind Daniel soft rush has been planted. 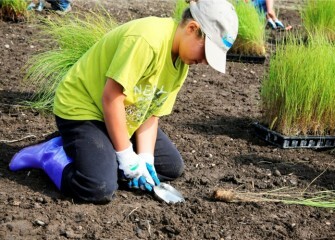 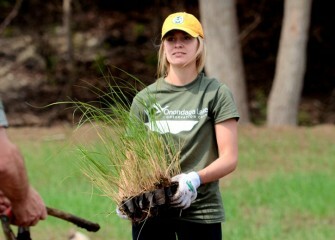 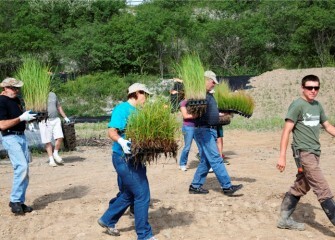 Volunteers planted 1250 native plants on Saturday morning. 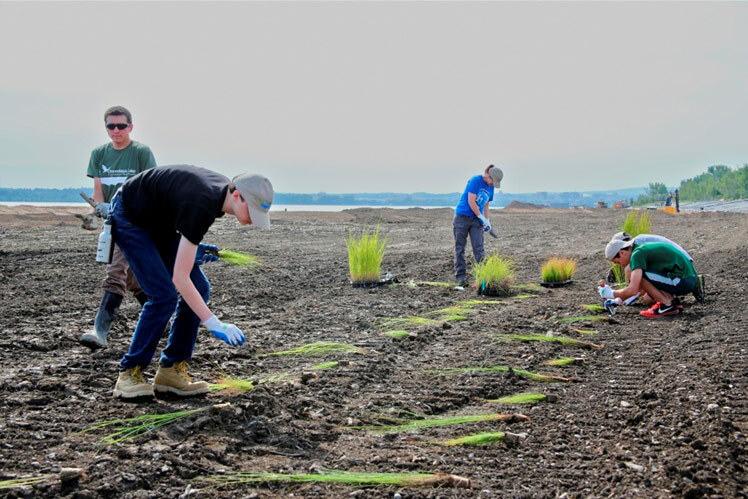 May 2015 - Twenty acres along the western shoreline will be transformed into new wetlands and improved habitat for wildlife. 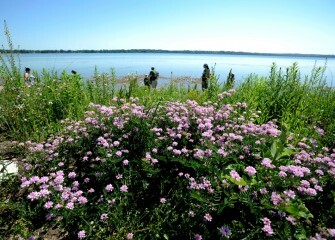 May 2015 - New England aster, being planted here, blooms late in summer with purple flowers attractive to bumblebees and butterflies. 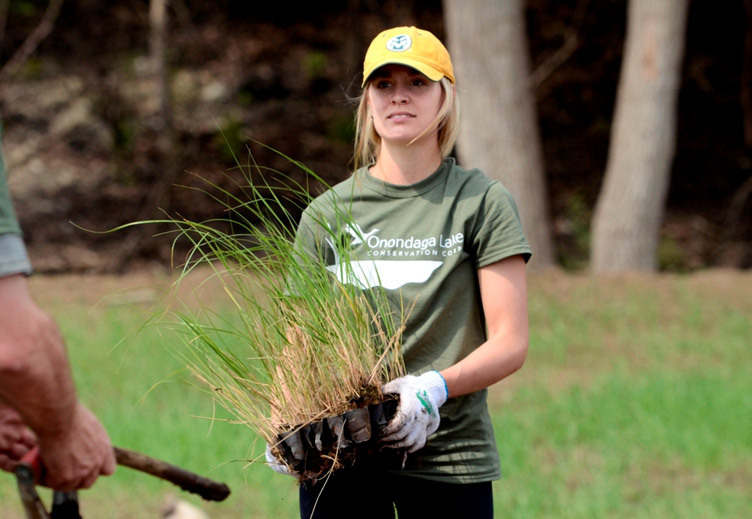 May 2015 - To date more than 323,000 native grasses, shrubs and trees have been planted. 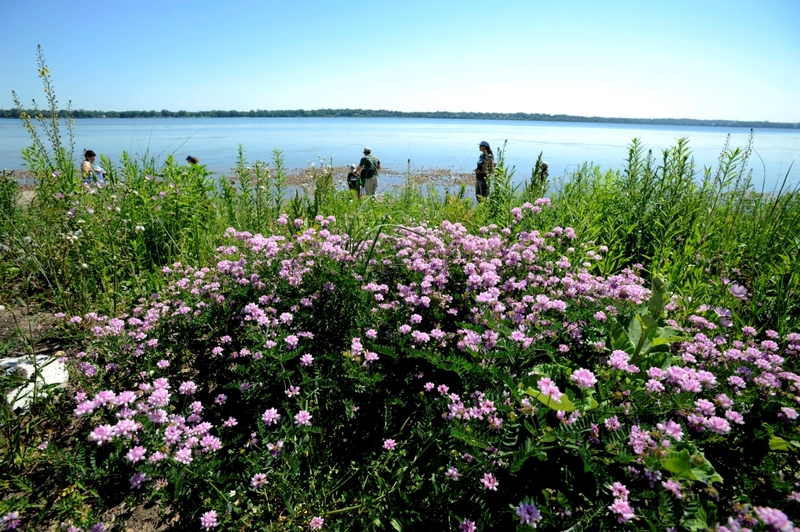 In July 2014, Conservation Corps members helped plant this wetland area along Onondaga Lake’s western shoreline. 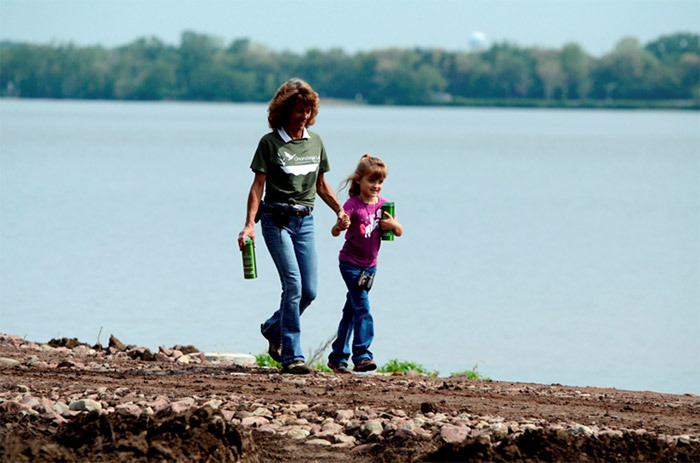 May 2015 - Karen Cahill and her daughter, Grace, walk along Onondaga Lake. 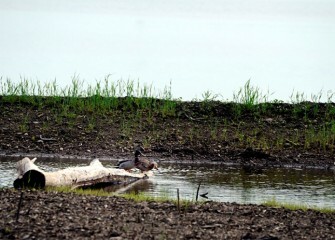 May 2015 - 100 species of native freshwater marsh, grassland, and woodland plant species will support aquatic habitat for amphibians, reptiles and birds, such as this pair of Mallards on a log near the new planting area. 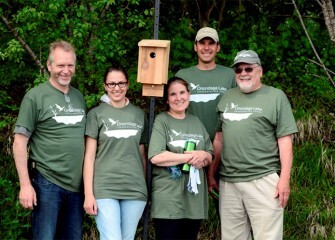 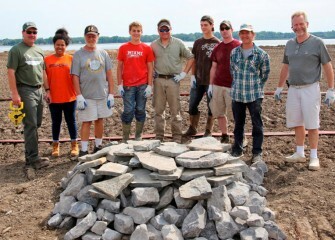 May 2015 - Onondaga Lake Conservation Corps volunteers (from left) Peter Haun, Nicole Schmidt, Diane Haun, Chris Lajewski, and Lawrence Keefe. 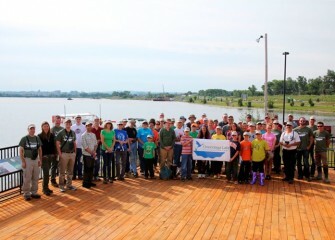 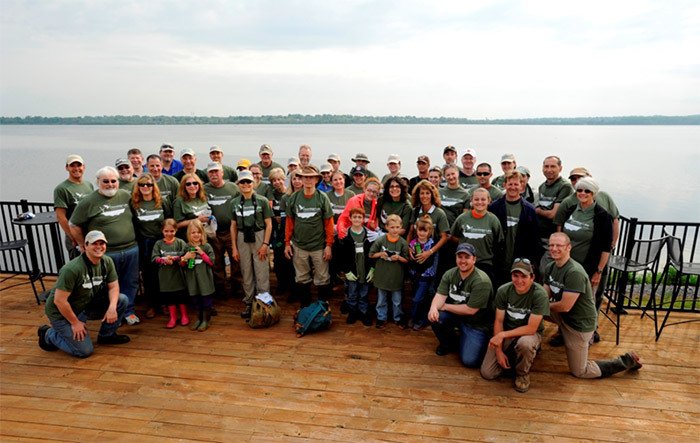 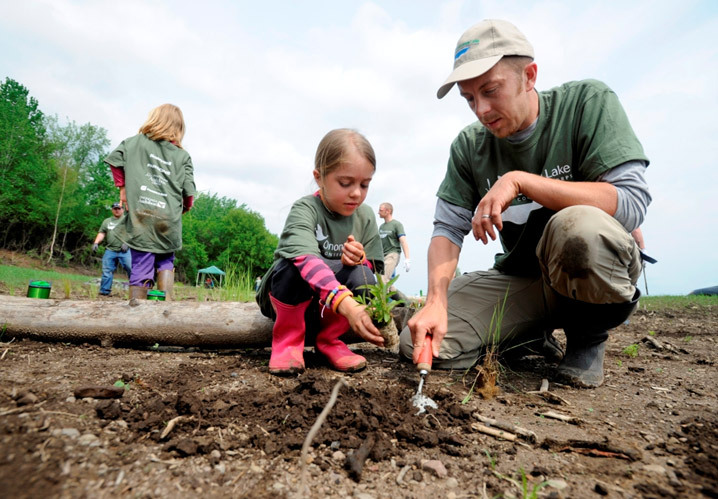 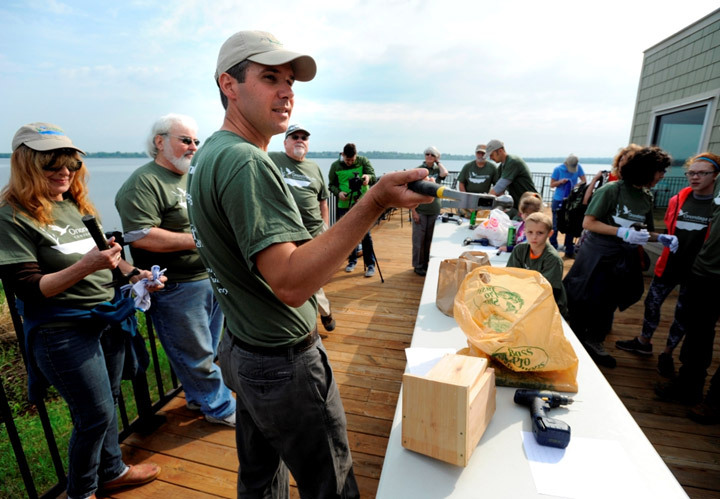 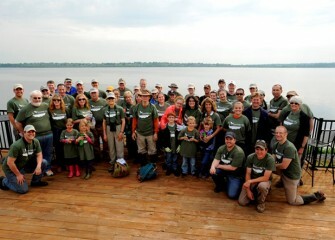 July 2014 - Fifty-five volunteers gathered Saturday, July 19, for the eighth Onondaga Lake Conservation Corps event. 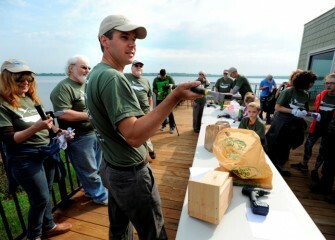 The Corps is now two years old; its inaugural event was held in July 2012. 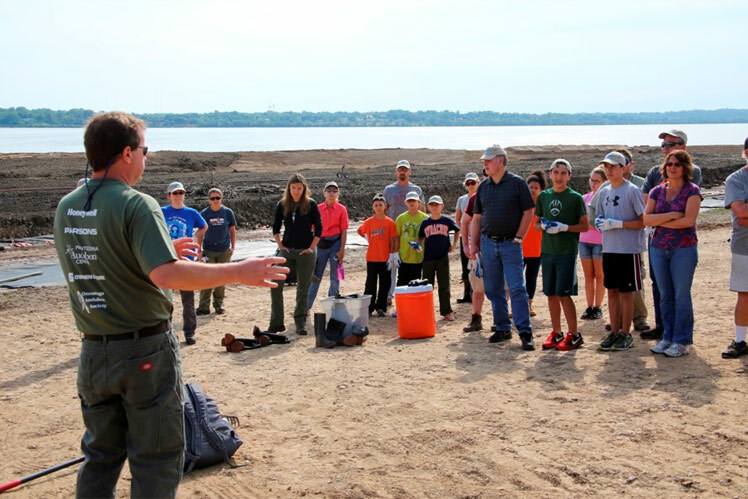 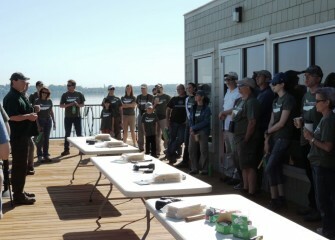 July 2014 - Steve Mooney, managing scientist at O’Brien & Gere and Corps volunteer, briefs a group of attendees before they begin planting along the Onondaga Lake shoreline. 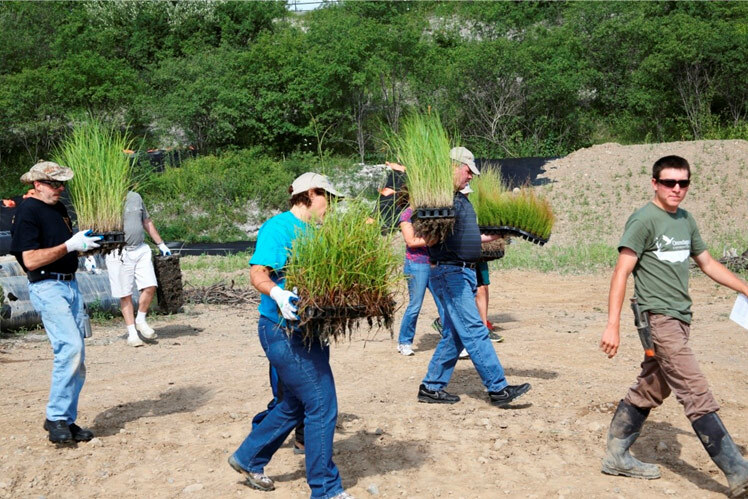 July 2014 - Volunteers carry native grasses – prairie cordgrass (left), fox sedge (center), and path rush (far right) - to the planting area. 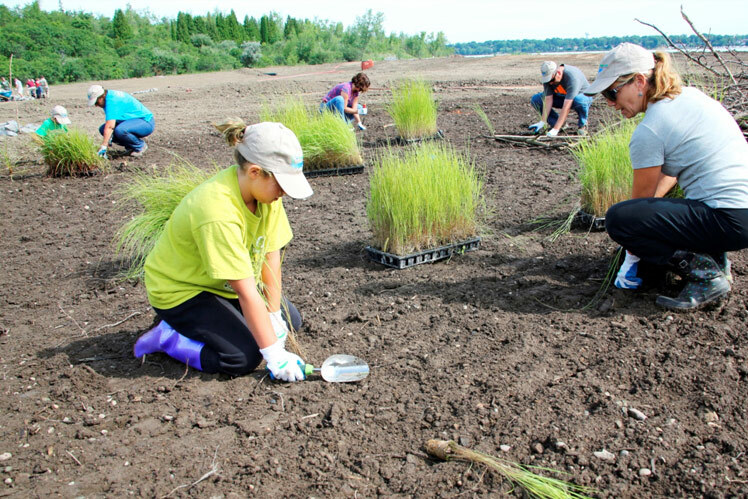 Prairie cordgrass was once one of the most common plant species on the western shoreline. 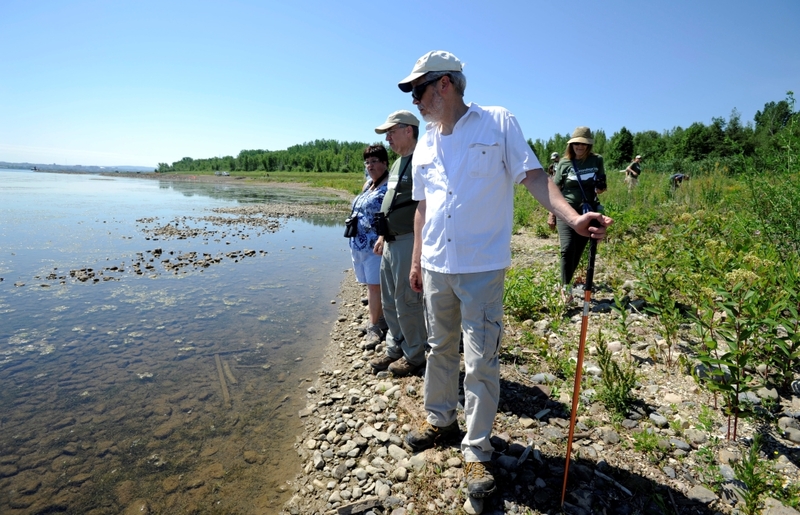 July 2014 - Up to 10 acres of wetlands will be created along Onondaga Lake’s western shoreline. 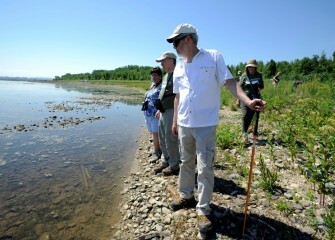 The wetlands will support fish, amphibians, reptiles and birds, including migrating waterfowl. 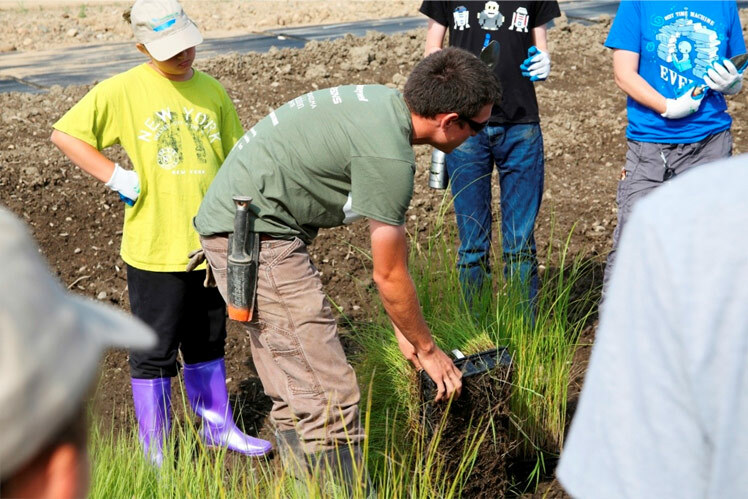 July 2014 - Keith Cardinali, scientist at O’Brien & Gere, demonstrates how to carefully remove individual prairie cordgrass plants, or “plugs,” from trays. 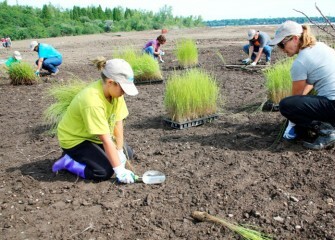 July 2014 - Volunteers lay out the young plants for proper spacing, in order to best establish the new habitat. The area will later be flooded with water to create the wetland. 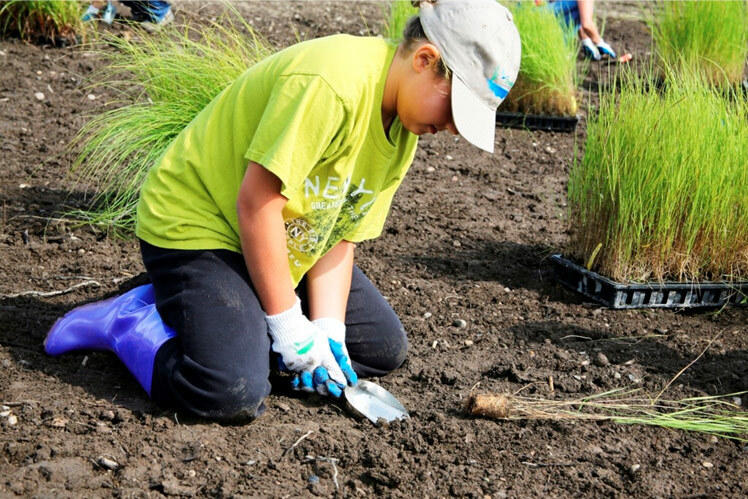 July 2014 - Julie Biondolillo (right) and her daughter Mara, from Pennellville, NY, choose the perfect spot to plant bluejoint grass. 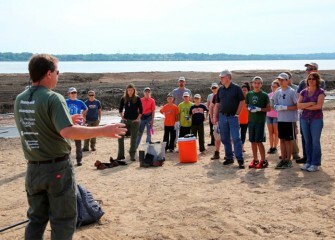 July 2014 - The hands-on activities offered by Onondaga Lake Conservation Corps are enjoyed by all ages as participants learn about the Onondaga Lake watershed. 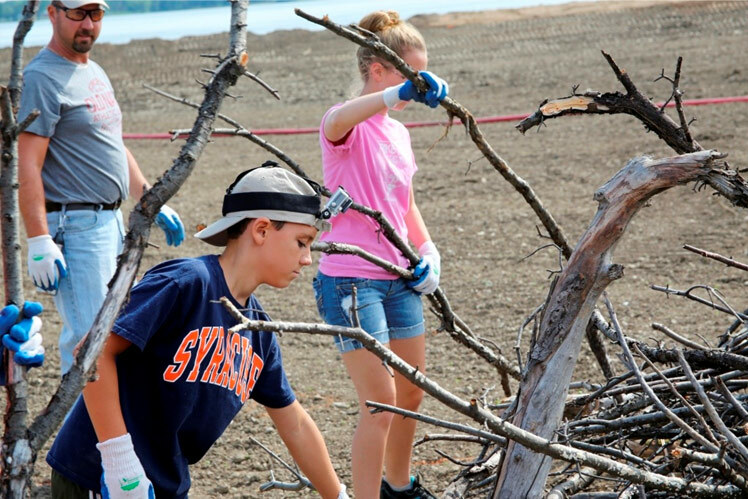 July 2014 - Onondaga Lake is showing remarkable signs of recovery. 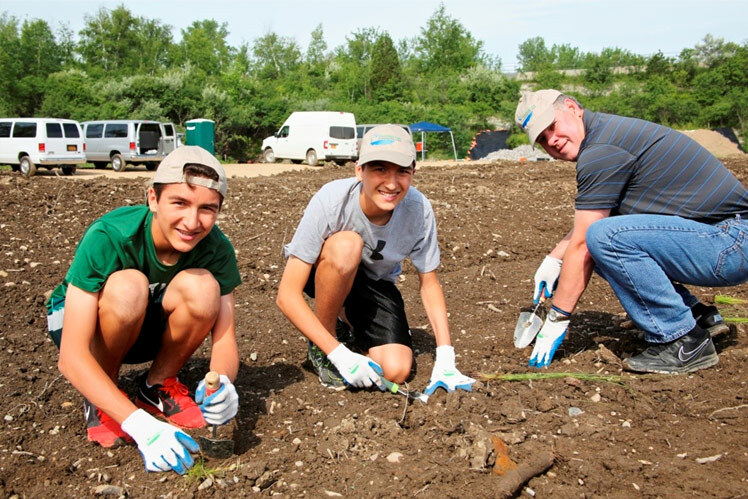 Twins Jonathan (left) and Brandon Formoza, along with Brian Kurish, participate in transforming the western shoreline into productive habitat. 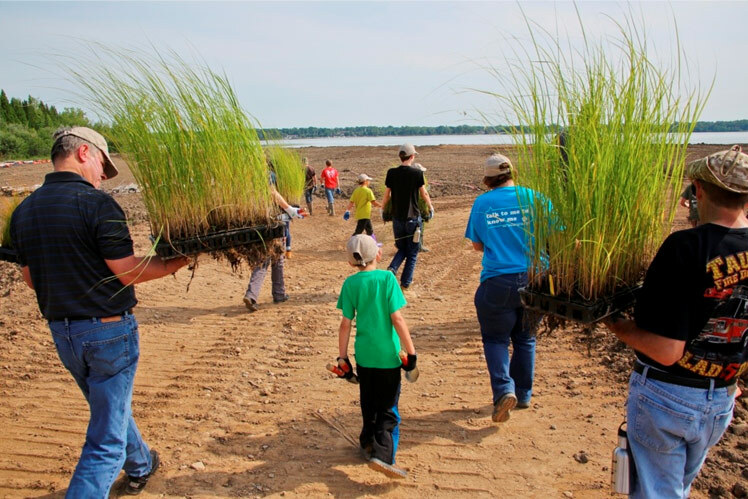 July 2014 - Altogether one hundred native freshwater marsh, grassland, and woodland plant species will eventually be planted in shoreline wetlands to create a healthy aquatic ecosystem. 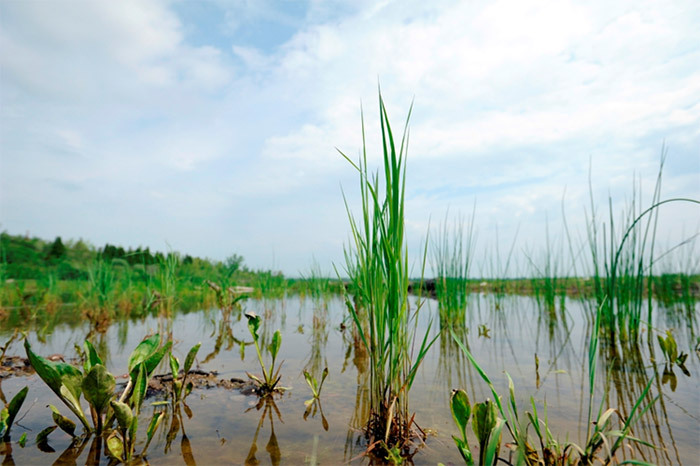 July 2014 - Brush piles provide immediate habitat for a variety of small mammals, amphibians and birds, as cover from harsh weather and extreme temperatures, safety in open areas, and locations to safely nest. 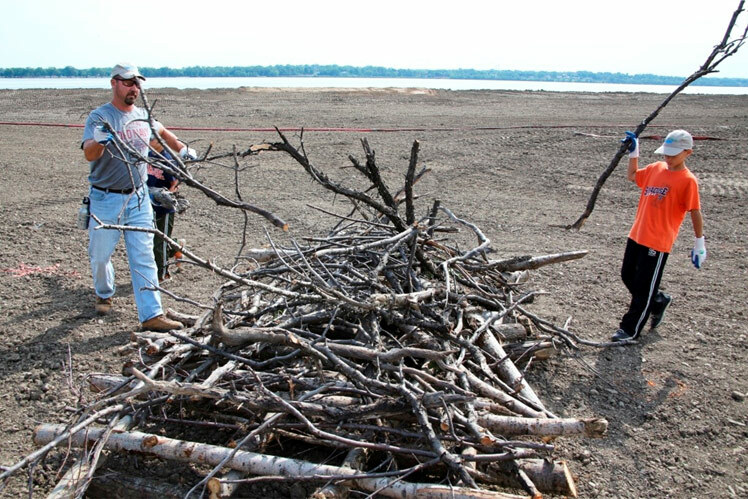 July 2014 - Brayden (right) and his dad Matt Biondolillo build a brush pile near the wetland area. 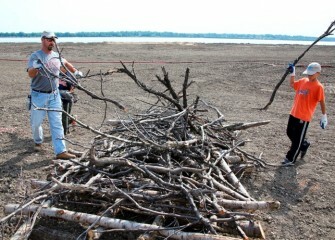 Brush piles are built in a stable arrangement, with heavier pieces forming the foundation near the bottom, and adequate spacing between branches. 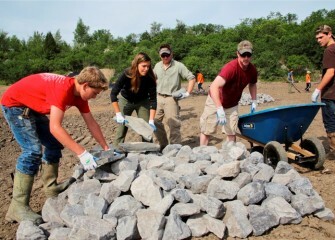 July 2014 - Natalia Cagide-Elmer (center), environmental engineer at Parsons, works with other Corps volunteers to build a rock pile to support reptiles and small mammals. 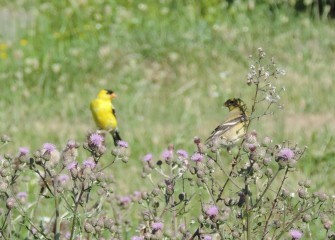 Smaller animals in turn serve as food sources for larger animals and birds. 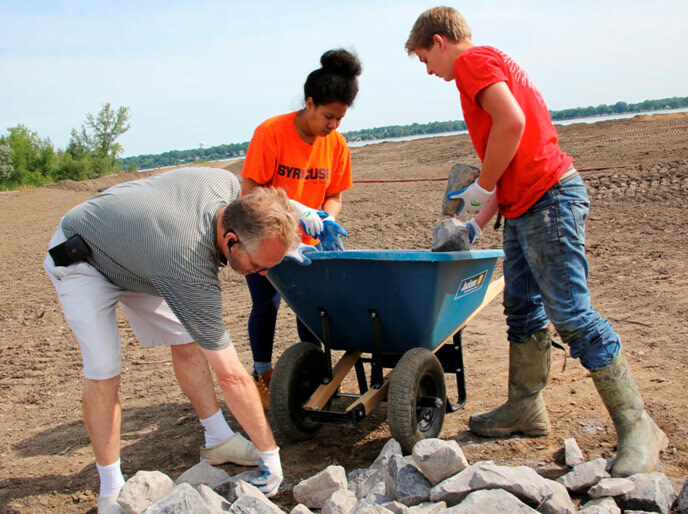 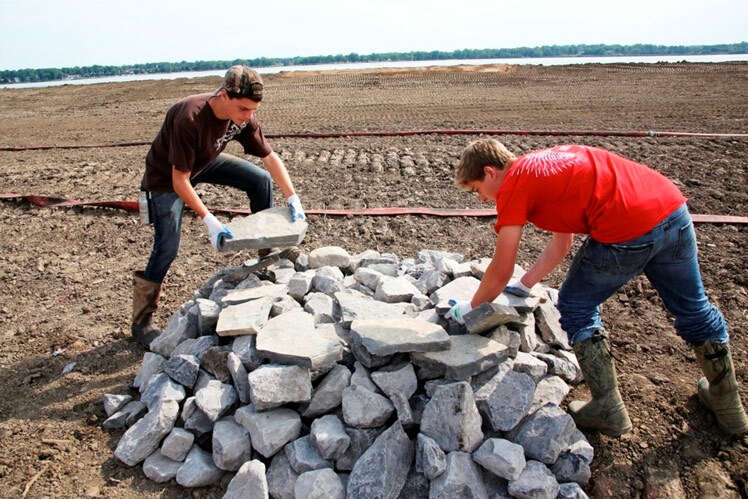 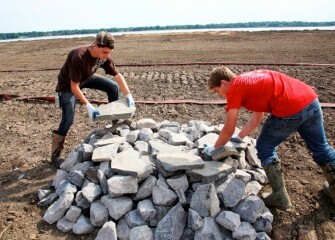 July 2014 - Peter Haun (left) from Camillus, Patrina Bailey (center), a Syracuse University engineering student, and Matthew Goetzmann from Skaneateles place rocks by hand to form a stable structure. 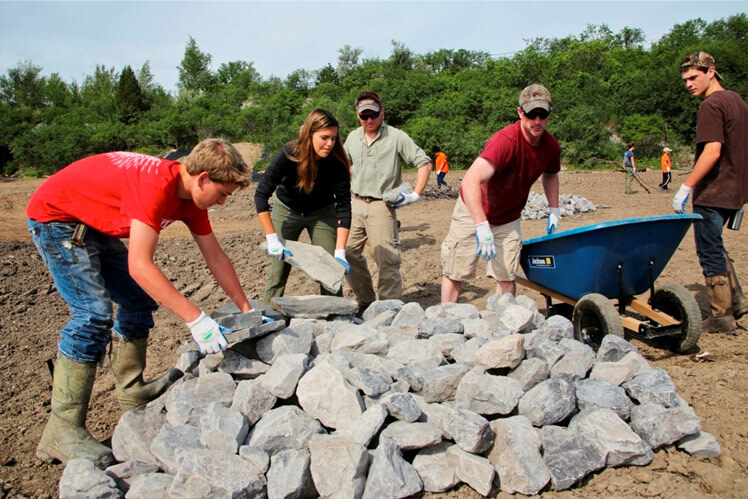 July 2014 - The flat rocks on top of this rock pile will provide turtles and snakes surfaces to bask in the sun and warm themselves. 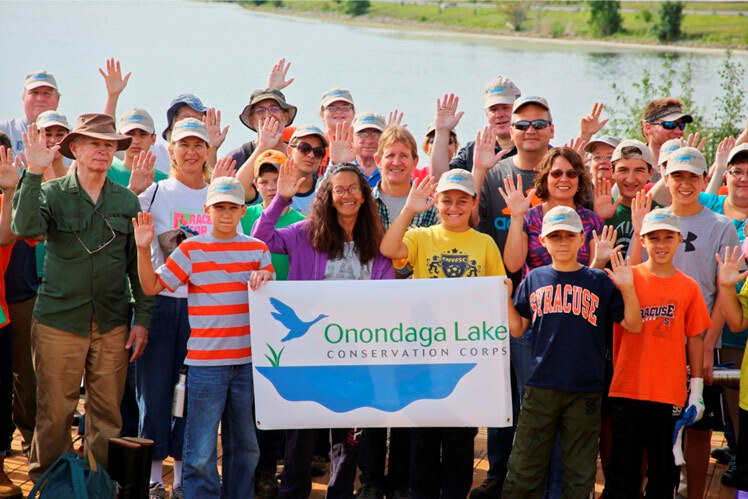 July 2014 - The day’s activities will help restore a healthy Onondaga Lake ecosystem and sustain the lake’s value as an Important Bird Area. July 2014 - Volunteers rotate through several activities. 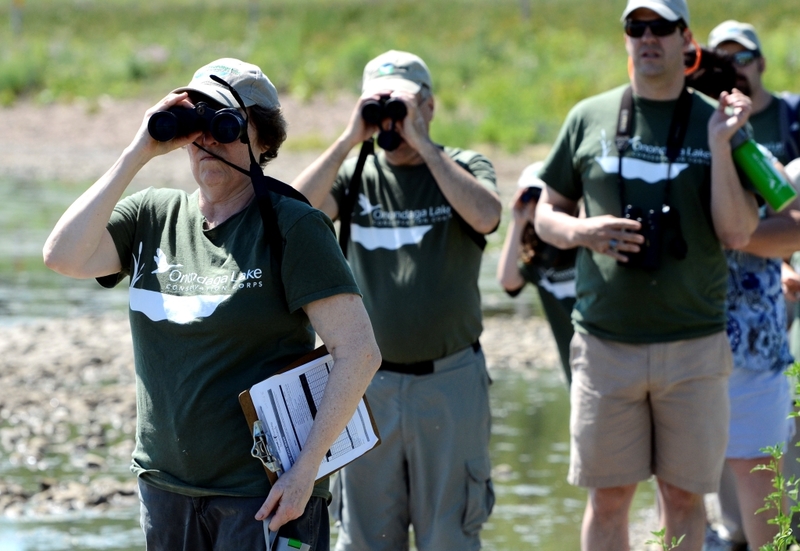 With help from Audubon, 41 species of birds are recorded, including wood duck, killdeer, downy woodpecker, and American goldfinch, to name a few. 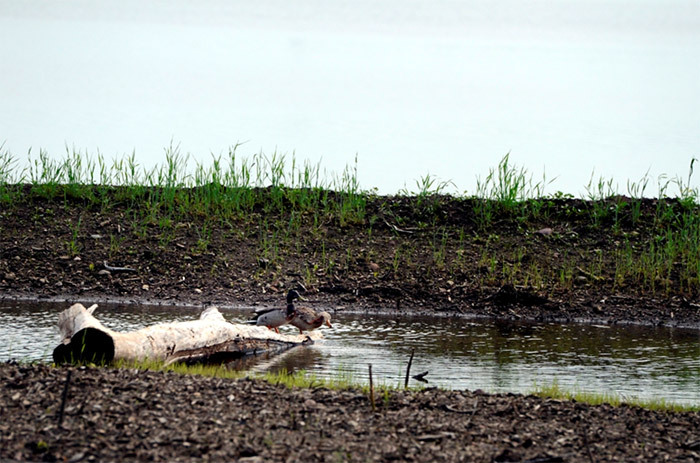 July 2014 - A week after the Corps event, rain and pumped water begin to fill the new wetland along Onondaga Lake’s western shoreline. 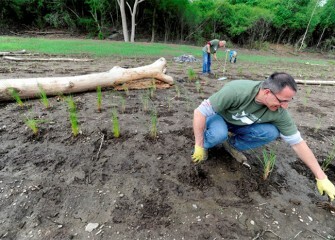 The area planted by Corps volunteers is in the background.